Old power and new power! 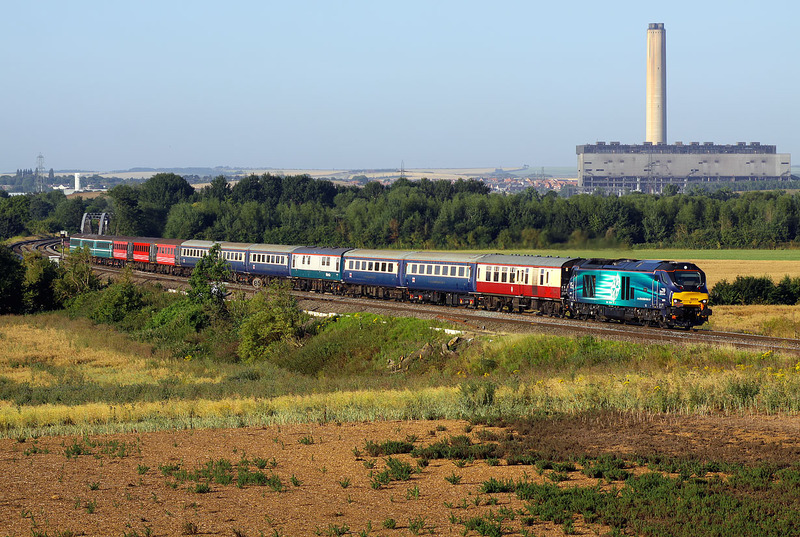 With the disused Didcot Power Station dominating the background, 68004 Rapid approaches Culham on 18 July 2015 with the Pathfinder Tours 1Z68 (appropriately!) 05:42 Newport to Carlisle 'Lakes & Border Explorer' railtour. This certainly makes a colourful picture, with five different liveries represented in the 13 coach train! For the first time since the introduction of the Class 60s in 1989 we have a new class of loco where some thought has gone into the visual aspect of the design. Not only does the class look good, but it sounds great as well. This could easily be heard leaving Didcot, a couple of miles away, and while not in the same league as Class 37s or 50s, is certainly an impressive noise.